In early February of 2015 I received a message from Kit Jagoda at River’s Wish Sanctuary in Spokane. 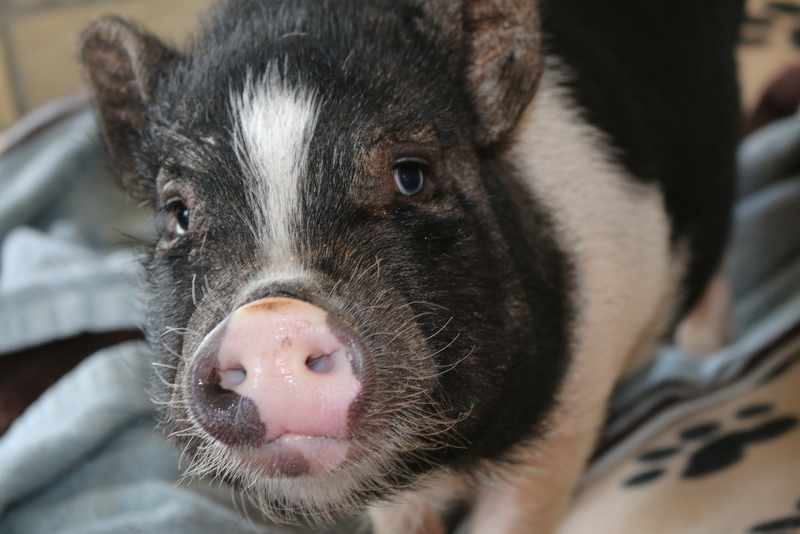 A woman in Spokane had contacted Pigs Peace Sanctuary (near Seattle) to explain that she desperately needed to rehome her 4 month old pot-belly pig, Onyx. She had brought him on her move from Florida and said she did not realize Spokane did not allow mini pigs in the city limits. Pigs Peace was full up with 190 pigs, and in turn contacted River’s Wish. River’s Wish was also at capacity. I said I just couldn’t since we hadn’t found an acreage and I didn’t know when we would. Of course, Kit knew my passion for pigs and sent me a picture and asked me if I was sure. I was sticking to my guns. “Not until we move. We have stairs to the backyard. We have a small yard. We just have to wait. I already have 6 animals.” I received a message a couple weeks later that Kit was going to meet the woman with the pig because she the woman had received notice of eviction if she did not get rid of her pig. Kit asked again if I was interested. I had been thinking about Onyx for the last couple weeks and was considering it. The next day Kit sent me more pictures. She had me. I said yes. She said he needed to be neutered and we could pick him up in a couple weeks. Evidently his hormones were raging and everyone and everything looked like a female pig and he was wreaking havoc with the dogs and other pigs in the house. Once he was neutered the hormones would leave and he would be able to be a good companion. He was neutered, and on February 28th Jewel and I drove to Spokane to pick our lil man up. I wasn’t sure what to do with this blue eyed creature lying next to the heater on the floor. He was adorable- yes, but not being that familiar with pigs i didn’t know what to do. Could I pick him up? Would he swipe or bite or chase me? Kit brought out some pig treats and he was up and running toward us. We loaded up Onyx in our carrier with his favorite blanket and headed home. I was so very excited! I was already smitten with Onyx and I was determined to be the best pig mom so he would not be sad having already lost his previous mom. Pigs are very sensitive animals and become attached to their human and animal herd. They mourn loses and can become very depressed when they lose a beloved one. I had set up Onyx with his own bedroom with a piggie litter box, blankets and of course his favorite- food.He was a bit timid letting me touch him for the first week- only for dinner and treats but soon after would flop over for belly rubs. As much as wanted the family to embrace our new guy, Jewel was the only one as keen as I, and would be the story forever forward, but I will save family dynamics for another post. We kept him separate from the dogs for several days so they would get used to eachother’s scent and I could figure out the best way to introduce them. The dogs didn’t really care for or about Onyx once they met. Of course fearless Onyx, the size of toy poodle, took it upon himself to challenge and charge the both of them every time he saw them. They gave a few warning snarls and snaps, and after a few days they all became tolerant of one another without major incident. I did not ever leave them unsupervised together-as pigs are stubborn and even though they can easily be killed by a dog, it is not in their nature to back down. Also, dogs are natural predators and pigs are prey. I’d read horror stories of dogs turning on their pig pals even when raised together-and the pig always loses. And so began a new chapter of our lives with a house pig, with it’s ups and down, exciting challenges, and is never a dull moment.